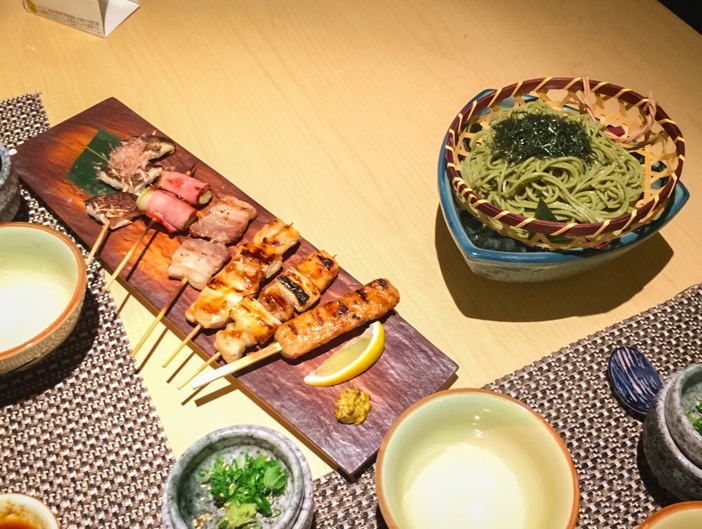 I have a new favourite Japanese restaurant: Mizuki in Wan Chai. We found it on Openrice and just went one evening… and two days later we went back again. It’s that good. It’s tucked away on Thomson Street on the second floor of Mirage Tower. The restaurant is small, about 10 tables and one sushi counter. Every time we went it was busy and there were several Japanese people eating out, which is a great sign. 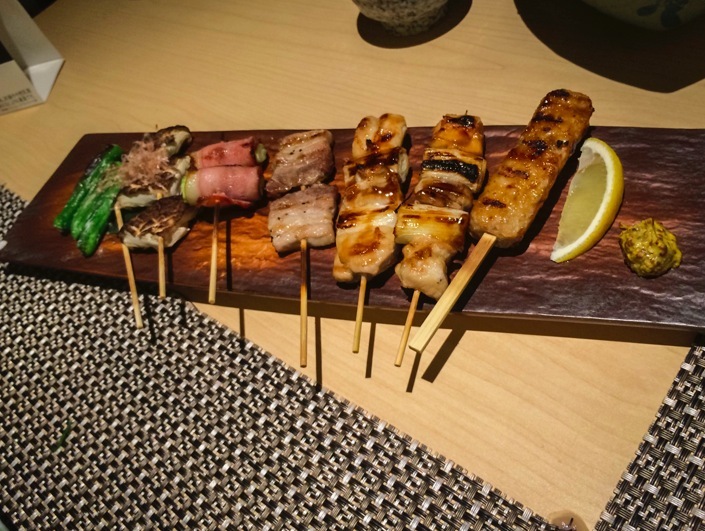 The first time we went, we ordered different skewers from the menu, they were all very tasty. 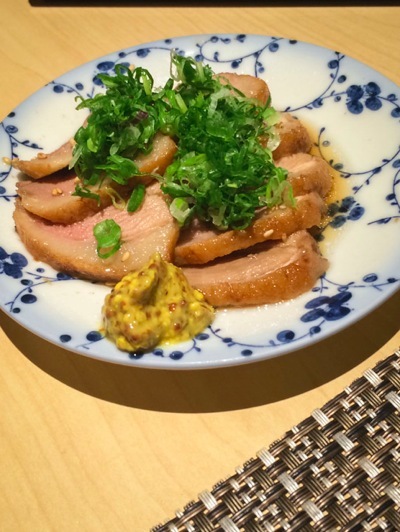 But what stood out was the duck breast from the daily menu – very flavoursome and tender, it went well with the mustard and the beer we ordered! Then we also had some green tea soba noodles – the first time I had cold soba noodles since our Japan trip two years ago. I loved the green tea flavour, so delicate. The noodles had the right elasticity and were very tasty. We also had some sides of edamame (probably the largest portion I’ve ever seen – this is only one order) and some miso soup. 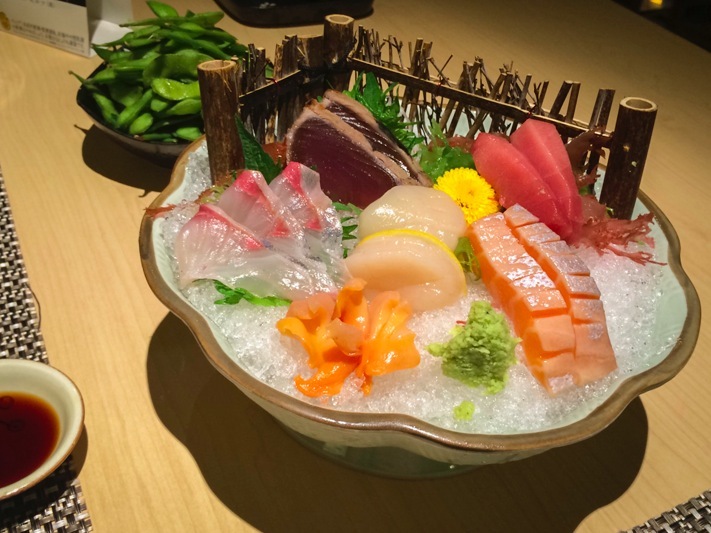 The second time we went, we ordered sashimi – a mixed platter that included salmon, tuna, scallops, ark shell and yellow fin. We also shared a small starter of wasabi octopus (sorry, no picture) which I never tried before – it was slimy but so tasty! Overall, the fish was very fresh, one of the best we have ever had in Hong Kong. 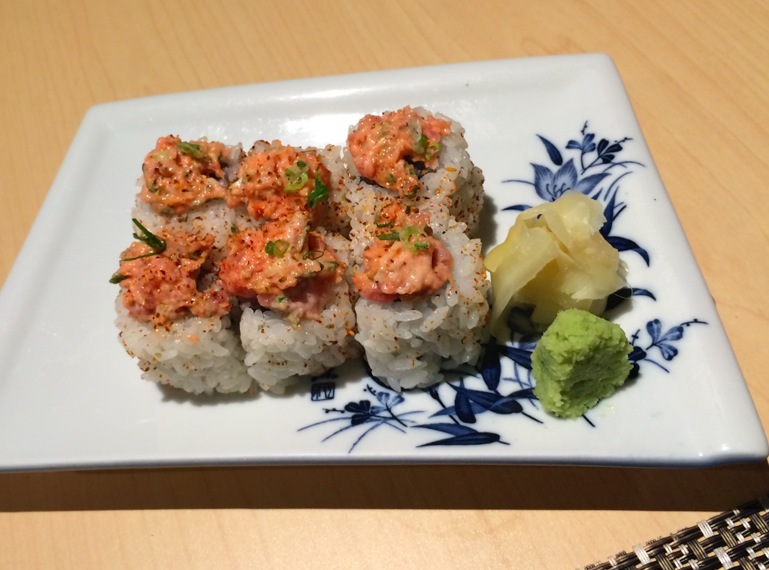 Plus a side order of spicy tuna rolls for me, as I was very hungry that evening. The rolls were a bit too loose for my taste, the rice was almost falling apart – but again, the tuna was very fresh and tasty and the filling was generous. For dessert we could choose between green tea ice cream (nice) and sweet potato pudding (fantastic). 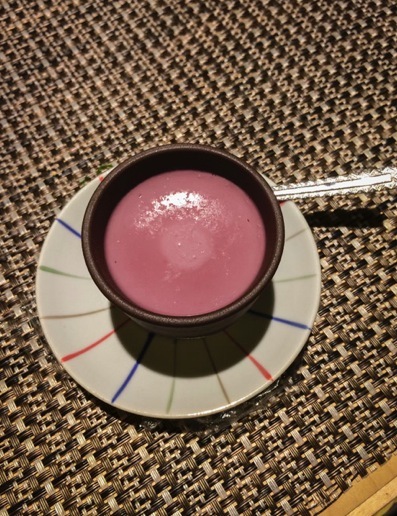 We had both but the star is the purple sweet potato pudding. The service is very attentive, the quality of the food is high … and yes, the price is not cheap. We usually spend between 350-450 HKD per heard. But it’s totally worth it. 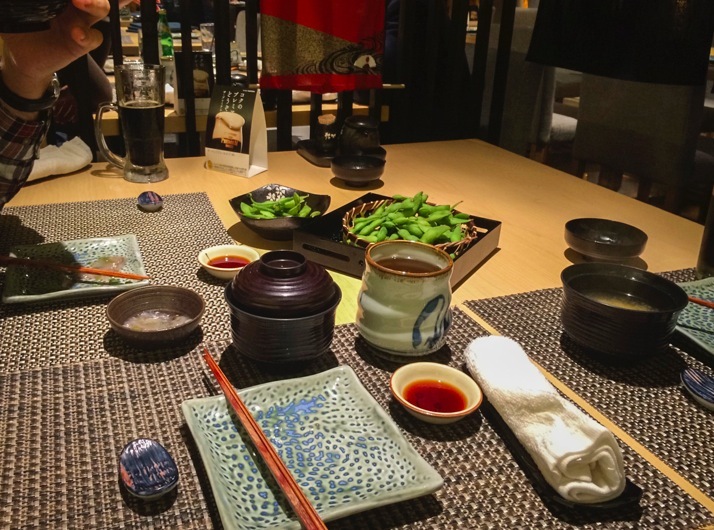 It has become our new favourite Japanese restaurant in Wan Chai! Would I eat there again? 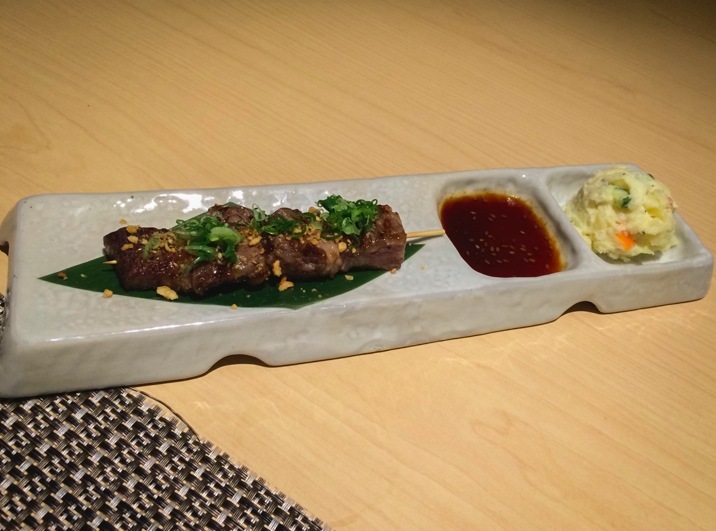 Yes, totally – great food, especially the freshness of the sashimi! I also like that they have a special menu with seasonal items!